What's the point of studying business from a social perspective? How can sociology aid my understanding of the big issues facing businesses today? Can thinking sociologically really equip me better for a career in business? This book provides an indispensable introduction to business and organizations from a social perspective. Using classic and contemporary ideas and evidence, the book explores the connections between people, work, organizations and society. Carefully illustrated with a range of up-to-date case studies, the book shows how sociology can shed light on current developments in the business world. Drawing on their considerable experience of teaching sociology to a range of audiences, the authors provide a straightforward but still stimulating step-by-step guide to issues such as: discrimination and diversity in the workplace; trade unionism and industrial disputes; the need for ethics and legislation; and the changing roles of managers and employees. In-depth case studies linking sociological ideas to business realities. Written with the needs of students taking degrees outside the traditional social sciences in mind, such as business studies, human resources and management, the book is suitable for those approaching sociology for the very first time. Accessible and inspirational, it will help students to grasp new and exciting possibilities for thinking about business in the contemporary world. Chapter 2: Understanding Societies: from capitalism to postindustrialism. Chapter 3: Societies and Change: globalization and the knowledge-based economy. Chapter 4: The Nature of Work. Chapter 5; The Meaning of Work. Chapter 7: Managers, Workers and Behaviour in Organizations. Chapter 8: Social Divisions and Inequalities. Chapter 9: Work, Community and Action. "Should be placed high on relevant reading lists, as an informative, persuasive, practical vaccine against banality and bias in OB and HRM." "This vibrant, thought-provoking book brings the insights of social-science to business studies. With accessible language and illustrations, it introduces classical and contemporary theories and shows how they shape our understanding of the world of work, organizations and business, including topical issues such as the environment, neoliberal policy, changing technologies and global interdependencies. It is one of the most comprehensive and imaginative contributions to the study of work, employment and society that I have read. I have no doubt this highly original book will become one of the most important texts in the sociology of work and business studies for years to come." "This impressive introductory text offers a refreshingly clear approach to understanding the contested role of business in society. Accessible and engaging in equal measure, and avoiding the pitfalls of shallow oversimplification, the book will appeal to students in both sociology and business and management studies, and provide a breath of fresh air for their teachers." This is the only book of its kind on the market. 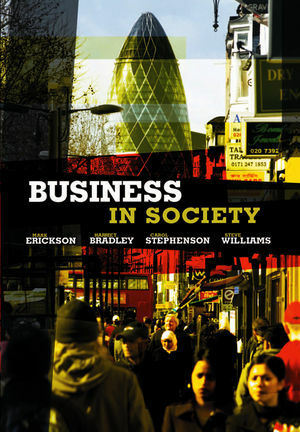 Demonstrates how principles of sociology can improve the everyday world of business, organizations and management. Provides an accessible and jargon-free introduction to basic concepts in sociology for students outside the traditional social sciences with no background in sociology – in the same vein as Polity’s ‘Sociology for Nurses’ and ‘Sociology for Social Workers’. The authors have a wealth of experience teaching sociology to a wide range of audiences. Packed with student-friendly features such as: clearly defined learning aims; questions for discussion and reflection; real-life case studies; thought-provoking illustrative material; annotated reading. Offers a step-by-step guide to crucial issues such as: discrimination and diversity in the workplace; trade unionism and industrial disputes; the need for ethics and legislation; the changing roles of managers and employees.